This comfortable and contemporary terrace/deck system embellishes and enhances any space with its functional properties and sense of luxury. Esthec® Terrace offers unprecedented freedom in colour and texture, which allows the terrace to be integrated into an overall design scheme. Esthec® Terrace offers the owner and architect technical and aesthetic advantages and allows them to support the trend to limit the use of scarce natural resources. 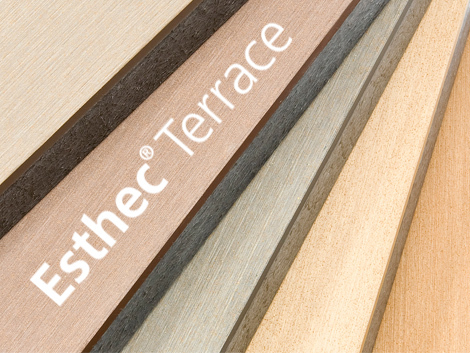 Esthec® Terrace is supplied in a standard plank size. Material Description | Composite Plank consisting of a Fiber-reinforced glass member structural base, with composite top coat and proprietary fixing clips, extruded into standard plank sizes and shapes.